I've moved some of my lists of Battle Mountain performances here - I was posting too much in the other forum - I'd rather it be about the teams and discussion rather than my "LISTS"
I may edit this later. I hope its just been an interesting outlook at a wonderful event. As always, my comments are unofficial. Numbers 43 & 67? Mike, we gotta get with the program! 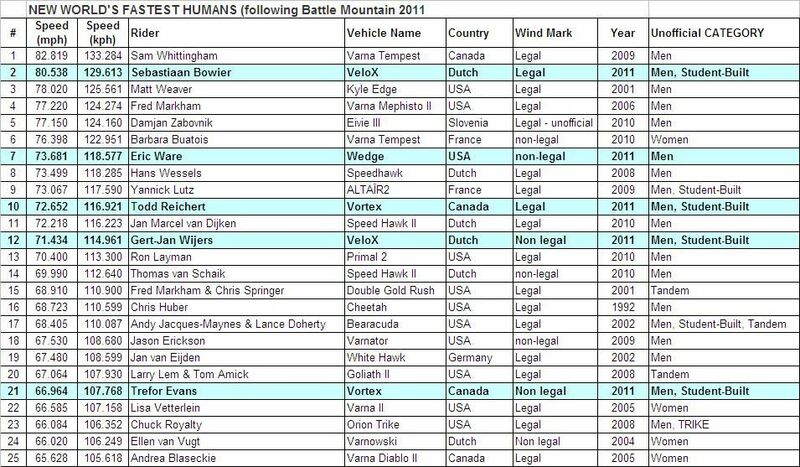 NEW WORLD'S FASTEST HUMANS (following Battle Mountain 2011 ? I see a tandem mark for Tom Amick and I, and an individual mark for Tom, but not an individual mark for me. 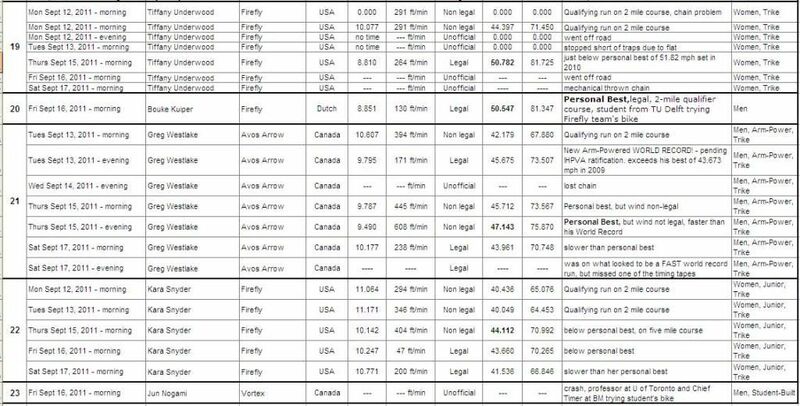 Do you want to list individual and multi-rider marks or just the fastest mark? 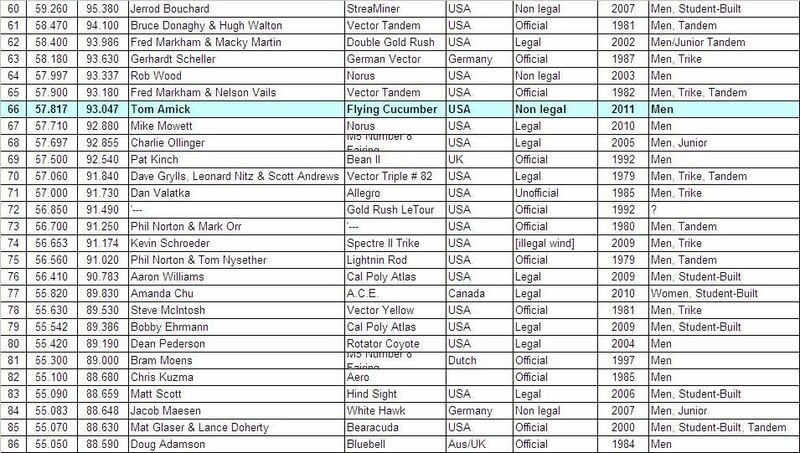 In 2009, I did 62.042 mph wind legal in Scimitar. PS: thanks for maintaining this massive spreadsheet. All runs are considered, but some reason the recumbents.com filter skips your individual mark. I think because your tandem mark is higher. I'll try to work on that with Warren. 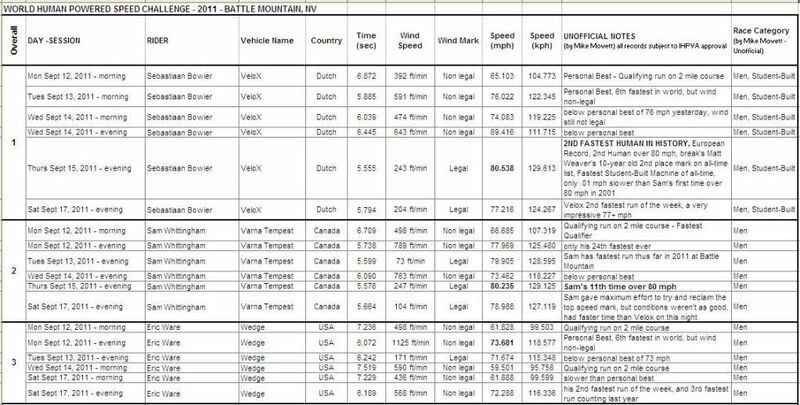 The list above was partially sorted by the recumbents.com filter and then sorted by myself with the new Battle Mountain 2011 runs. A rider's lifetime best, both in a tandem and individual should show up on the list. If you go faster in a different vehicle, only the best mark is kept - hence Fast Freddy's Dupont prize winning 65 mph Gold Rush run no longer makes the list as he went 77 mph in a Varna. Though some might say a wind non-legal run should not be counted, I feel that still deserves mention. A rider pedaling hard for 5 miles should not be at the mercy of one wind measurement at the traps. 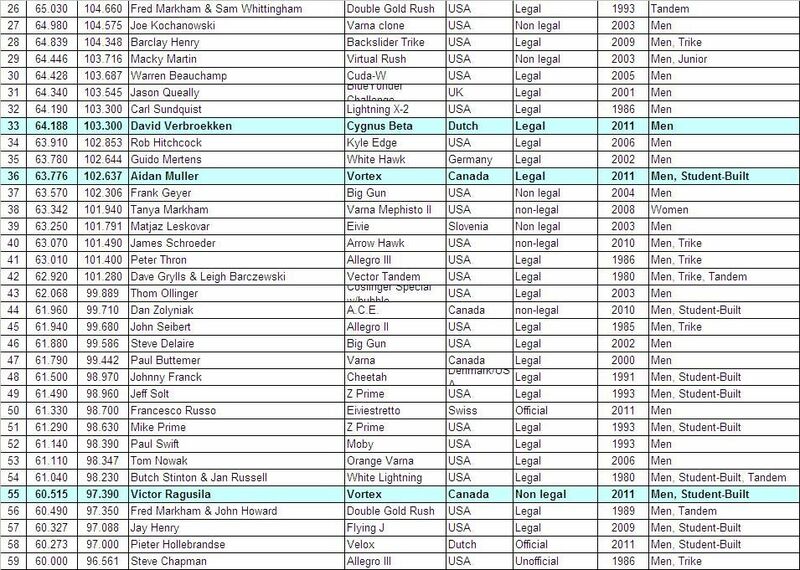 I agree that the wind must be Legal for a world record, but not for my Lists.